Shell has declared victory over the major oil spill from their Bonga FPSO off Nigeria, claiming the slick was halted 12 miles offshore and has mostly dissipated, thanks to evaporation plus the use of chemical dispersants. Our observations of satellite images over the past few days don’t indicate anything to the contrary. How big was this spill? 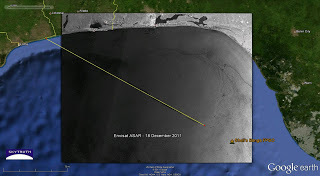 We think the amount spilled is near the high end of Shell’s estimate of “up to” 1.68 million gallons, based on the size of the oil slick observed on December 21 and the photos provided by Shell showing a rainbow sheen. The thickness of “rainbow sheen” is in the 5 to 10 micron range according to the CONCAWE guidelines, and 0.3 to 5 micron range according to the BONN convention. The overlap — 5 microns — would mean a spill of at least 1.2 million gallons (28,571 barrels). 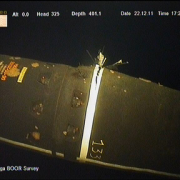 https://skytruth.org/wp-content/uploads/2011/12/Shell-cracked-transfer-hose-pic-22dec2011-1.png 288 352 John Amos /wp-content/uploads/2016/08/test_logo.png John Amos2011-12-27 20:28:002019-02-21 09:46:04Shell Oil Spill off Nigeria - How Big? MODIS/Terra satellite image taken December 23, 2011 at 10:10am local time. 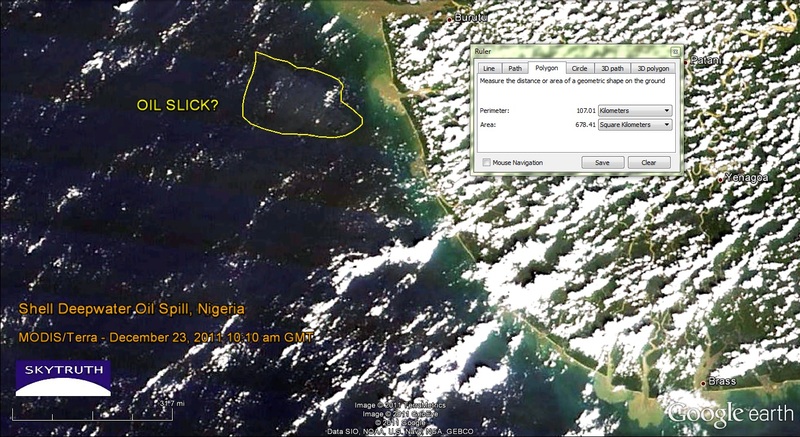 Possible location of oil slick noted. Image data courtesy NASA/MODIS Rapid Response Team. This fuzzy patch that may or may not be the remnants of the oil slick is located about where we would expect to see it, given the wind speed and direction over the past couple of days (blowing from the south-southwest at 5-10 knots). Radar imagery would give us a better look but we haven’t seen any new radar images since December 21. So far we haven’t heard that any oil has come ashore. Shell reports they have mounted a vigorous response, including the use of chemical dispersants to break up the oil slick. 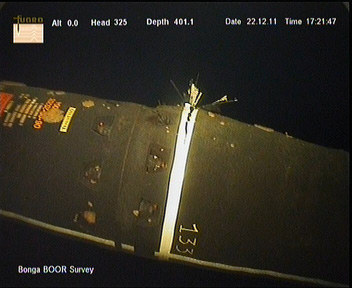 Yesterday Shell also released this photograph showing what purportedly caused the leak – a small crack in a transfer line at their FPSO. Engineers, tell us – how long would it take to spill >1 million gallons of oil from a relatively small break like this? I don’t know the diameter of this line; possibly 20″ or so? 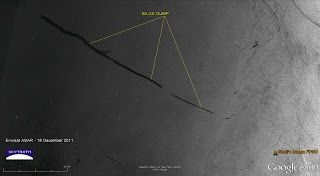 Photograph reportedly taken by ROV showing crack in transfer line. Photo courtesy Shell. Let us know if you have any expertise on flow rates through pipelines, and are willing to provide some expert opinion on this. 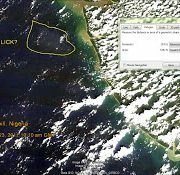 Shell Oil Spill off Nigeria – Questions…. We’ve got a few questions for you savvy engineers out there about Shell’s spill during loading at their FPSO in the Bonga field off Nigeria. 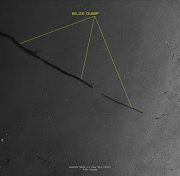 Based on the size of the oil slick on satellite images yesterday, and photos of parts of the slick released by Shell along with statements made on their website (scroll down to read the comments), we think that the spill may be near the high end of Shell’s public estimate of up to 1.7 million gallons (40,000 barrels). How long does it take the workers onboard to notice that, hey Houston, we’ve got a problem here? How long does it take to shut off that pump? How long would it take to pump 1.7 million gallons of oil into the water? 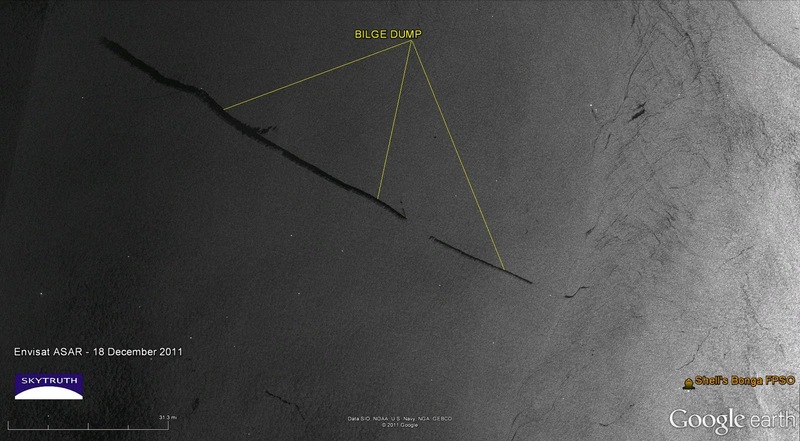 Please let us know by commenting on this post if you have any expertise in this area and can help shed some light on how a spill of this size could have occurred during the routine transfer of oil from an FPSO to a tanker. 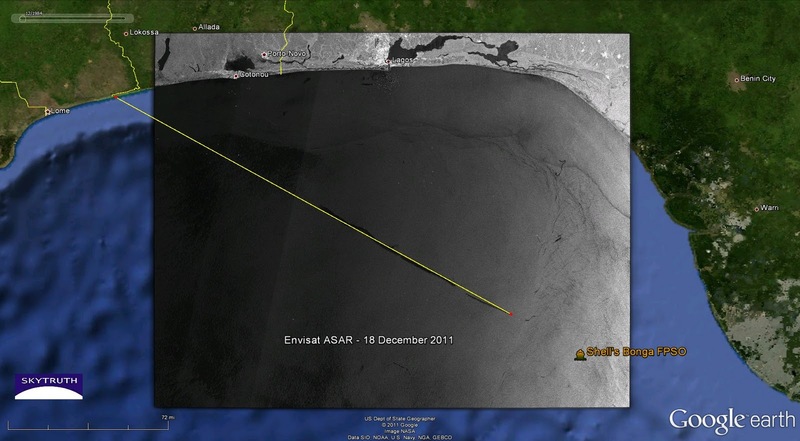 Nigerian authorities are predicting that oil will begin to come ashore this afternoon. Since November 8, there have been 8 different reports to the National Response Center coming out of the Sunoco Oil Refinery in South Philadelphia. The initial report stated that oil from an unknown source accumulated and discharged into the Schuylkill River. Subsequent reports state that absorbant booms and pads had been placed in the water to absorb the sheen. The booms were repositioned and then changed out and additional absorbant pads were deployed, and still the reports keep coming in. The latest report from yesterday states that a vac truck is onsite to aid in removal of oil. I lived in South Philly, 2.5 miles from where this oil is leaking into the Schuylkill River. I have 3 brothers who live exactly 1 mile away from the Sunoco Refinery. Thanks to the SkyTruth Alerts System, I can see exactly what’s happening in my old neighborhood, and I can see that Sunoco obviously has a problem at their South Philly refinery and they’re cleaning up the mess but it doesn’t sound like they’ve found the cause of the problem. I’ll keep monitoring the area with my daily alerts, and I’ll be letting my brothers know that swimming in the Schuylkill River down by Sunoco probably isn’t a great idea this holiday season.